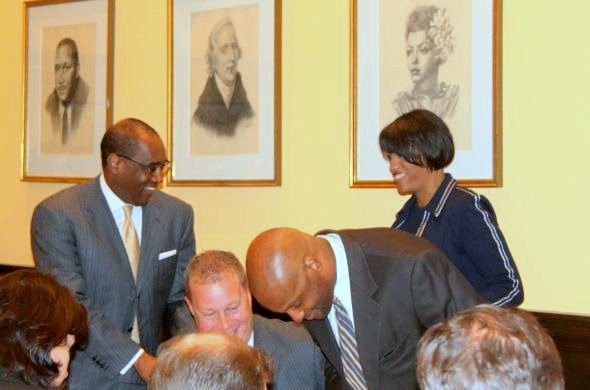 Above: Mayor Rawlings-Blake greets casino investors in October 2012 shortly before she signed the ground-lease revenue agreement. Seated at center is Horseshoe general manager Chad Barnhill. More disappointing news from the Horseshoe Baltimore Casino. Ground-lease revenues from the casino will amount to $4 million in the current budget year – far below the $14 million anticipated by the Rawlings-Blake administration. The lowered number, revealed yesterday by budget director Andrew W. Kleine at a City Hall budget hearing, means that nearly $10 million in Horseshoe revenues the city had counted on in its 2015 budget will not materialize. This deficit comes on top of lower community impact funds that are paid to offset the negative impacts of gambling on South Baltimore communities. In both cases, Horseshoe’s failure to attract large crowds to its Russell Street facility has left the city bereft of revenues it had gambled on – and offered to voters as proof that the casino would be a major moneymaker. The city had been confident that it would greatly exceed the $8 million minimal ground-lease payment by sharing 2.99% of the casino’s gross gaming revenues. But Horseshoe’s poor performance since it opened has dashed those hopes, making the $8 million minimal payment the best the city can expect. Even that, though, won’t be coming to the city during this fiscal year ending on June 30, 2015, Kleine acknowledged to the City Council’s Budget and Appropriations Committee. Although Caesars Entertainment Corp. agreed to pay the minimum $8 million in “year one” of its operation – the exact language of the contract is cited below – Kleine said that only $4 million will be paid by June 30. “The $8 million minimum is paid in two installments,” Kleine explained. In year two, the casino is required to pay a minimum of $10 million, which will increase to $14 million in year five under the contract. Kraft dropped his line of questioning, which took place over a few minutes near the end of the two-hour hearing. None of the five other Council members present – Eric Costello, Edward Reisinger, Brandon Scott, Rochelle “Rikki” Spector and chairwoman Helen Holton – made any comment, or expressed any concern, about the revenue shortfall at the casino. At yesterday’s hearing, Kleine acknowledged that the casino is now expected to contribute only 1 cent. “We will get at least a penny,” he told Councilman James B. Kraft. The mayor is still committed to lowering property taxes, Kleine said, but will have to look to other revenue sources to make up for the casino’s shortfall. The reduced amount of ground-rent revenues disclosed by the budget director mirrors the drop in local community impact revenues from the casino. The city originally estimated $15 million in revenues for year one, which was later reduced to $10 million and is now coming in at under $7 million. The casino has been averaging only $23 million a month in gross revenues since it opened in August, about a third of what was expected. This compares to $45-50 million a month generated by the Maryland Live Casino in Anne Arundel County. Originally, it was believed that Horseshoe would attract customers – and drain gambling dollars – from Maryland Live. But this has not yet happened. At the same time, the city is on the hook for a new Baltimore Police “mini-district” around the casino (which is budgeted for $1.5 million in overtime this year) and for road and steam-line improvements priced at more than $9 million. These expenses will be borne by current and future revenues from the local community impact revenues. In addition to generating fewer revenues than expected, Kleine said that Horseshoe has negatively impacted admissions and amusement tax revenues. Revenues from the tax are expected to drop by $2.8 million in fiscal 2015. What’s more, the amusement tax revenues from video poker machines have dried up, with Keno and other poker games disappearing from bars and restaurants since the 24-hour casino opened. “We’ve seen a lot of those machines go away. That’s casino related. . . because the casino is essentially putting them out of business,” Kleine noted.